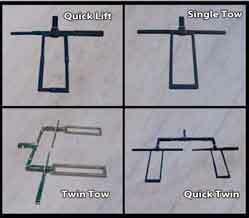 The Quick Lift Motorcycle products “Single Tow” is a one piece unit with a tie down bar designed to tow a motorcycle. 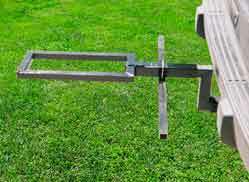 The Quick Lift Motorcycle Products “Single Tow” is also used with the with the Quick Lift Motorcycle Products “Twin Tow”and the Quick Lift Motorcycle Products “Quick Twin”. The Quick Lift Motorcycle products “Single Tow” can be used with the Quick Lift Motorcycle Products “Hi-Lo Adaptor” as shown here to get a better riding height on a raised or lowered vehicle. 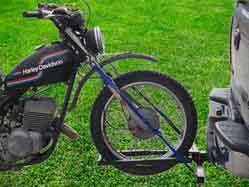 The Quick Lift Motorcycle products “Single Tow” fits into a standard 2” receiver. The “Single Tow” on a Pick-Up ready to tow a vintage Harley Davidson dual purpose bike found at a farm in Baja Mexico. 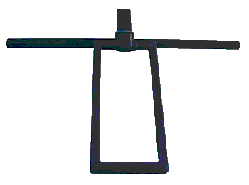 The “Single Tow” pictured is used without the Hi-Lo adapter. The Quick Lift Motorcycle Products “Quick Lift”, “Single Tow”, “Twin Tow”, “Quick Twin” and “Ramp Rack” all use the wheel/tire drop in slot to stabilize your bike. With the Quick Lift Motorcycle Products “Quick Lift” and “Ramp Rack” the wheel/tire drop in slot is adjustable for use from scooters to full size bikes.